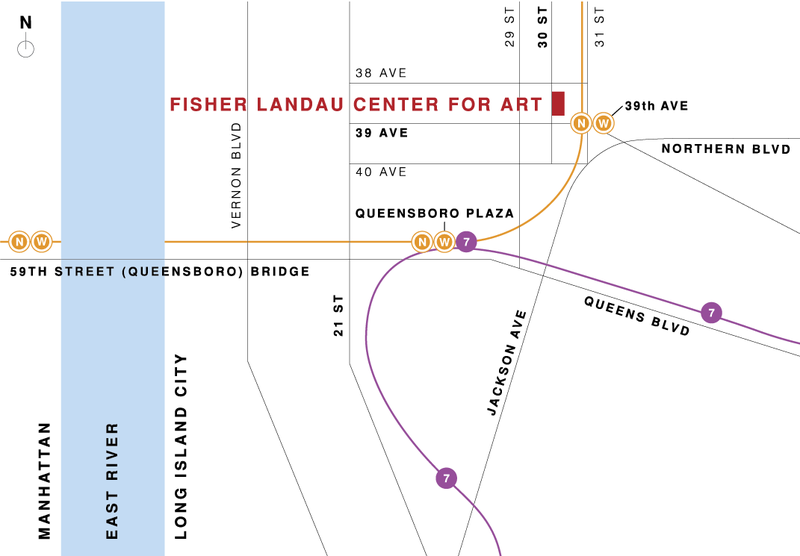 The Fisher Landau Center for Art has closed and is no longer open to the public. Take N train (all times) or W train (weekdays only) to the 39th Avenue stop. After going through the turnstiles take the right hand staircase. At the corner of 31st Street and 39th Avenue turn right and walk one block west on 39th Avenue, then turn right/north onto 30th Street. See www.mta.info for New York City Transit subway maps and further information. Take the upper level of the bridge (entrance at 58th Street and 2nd Avenue). Keep to the right along the ramp and follow signs to 21st Street. Turn right on 21st Street and continue 6 blocks to 38th Avenue. Turn right onto 38th Avenue, continue for 8 blocks, then turn right again onto 30th Street. Approaching Queens keep right and take the 31st Street Exit, the first exit off the bridge. Turn right onto 31st Street and continue underneath the elevated train line. Turn right onto 38th Avenue and take the first left onto 30th Street. Take the Grand Central Parkway to Exit 3/Hoyt Avenue (last exit before the Triboro Bridge toll). Keep left coming off the exit. Make the first left turn onto 31st Street (underneath the elevated train). Continue on 31st Street to 38th Avenue. Turn right onto 38th Avenue and take the first left onto 30th Street. Limited street parking is available. An indoor parking garage is located on 29th Street between 39th Ave and 40th Ave.
© Copyright 2017 Fisher Landau Center for Art. All Rights Reserved.